Frozen Movie Dress Up Game. Sisters & Princesses Anna & Elsa. Anna and Elsa dress up game from the movie Frozen. Dress up the Frozen's sisters Anna and Elsa. Find the most elegant clothes, the best makeup and choose a royal hairstyle for the Frozen sisters. Anna and Elsa live in Arendelle, Anna is a princess and Elsa is the Queen. Their best friends are Olaf, Sven and Trolls. 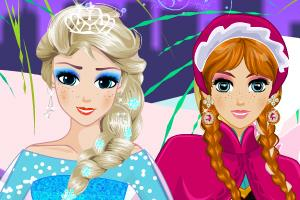 You can also play Frozen Make Up Game.